Hoboken Old Guard Vote-by-Mail soldier charged in promoting voter bribery scheme! NEWARK, N.J. – A Hudson County, New Jersey woman was arrested and charged today for promoting a voter bribery scheme by use of the U.S. mail, U.S. Attorney Craig Carpenito announced. Lizaida Camis, 55, of Hoboken, is charged by complaint with a violation of the Travel Act for causing the mails to be used to aid voter bribery contrary to New Jersey state law. She is scheduled to have her initial appearance today before U.S. Magistrate Judge Mark Falk in Newark federal court. Under New Jersey law, registered voters are permitted to cast a ballot by mail rather than in person. To receive a mail-in ballot, voters must complete and submit to their county clerk’s office an Application for Vote By Mail Ballot (VBM Application). After the application is processed, voters receive a mail-in ballot. From October 2013 through November 2013, Camis agreed to pay certain Hoboken voters $50 each if those voters applied for and cast mail-in ballots for the November 2013 Hoboken municipal election. Camis provided these voters with VBM Applications and then delivered the completed applications to the Hudson County Clerk’s office. After the mail-in ballots were delivered to the voters, Camis went to their apartments and, in some cases, instructed the voters to vote for the candidates for whom Camis was working. Camis promised the voters that they would be paid $50 for casting their mail-in ballots and told them that they could pick up their checks after the election at an office on Jefferson Street in Hoboken. Bank records show that voters living in Hoboken received $50 checks from entities associated with the campaigns that employed Camis. Camis faces a maximum penalty of five years in prison and a $250,000 fine. U.S. Attorney Craig Carpenito credited special agents of the FBI, under the direction of Special Agent in Charge Gregory W. Ehrie in Newark, and special agents of the U.S. Department of Housing and Urban Development, Office of the Inspector General, under the direction of Special Agent in Charge Christina Scaringi, with the investigation leading to today’s arrest. This story is breaking hard! 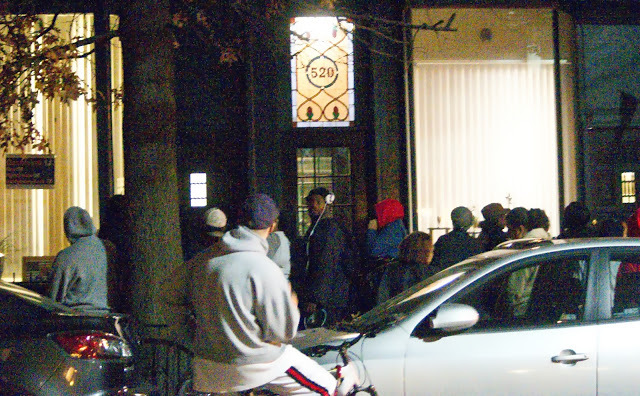 The scene the night after the election at 520 Jefferson Street back on November 6th, 2013; the fulcrum of an alleged voter bribery scheme operation exclusively reported on MSV. The following complaint filed against Liz "the Church Lady" Camis involving allegations of a voter bribery scheme using Vote by Mail ballots. and "Let the People Decide," the political committee allegedly behind it all in Hudson County Court pulls the plug.